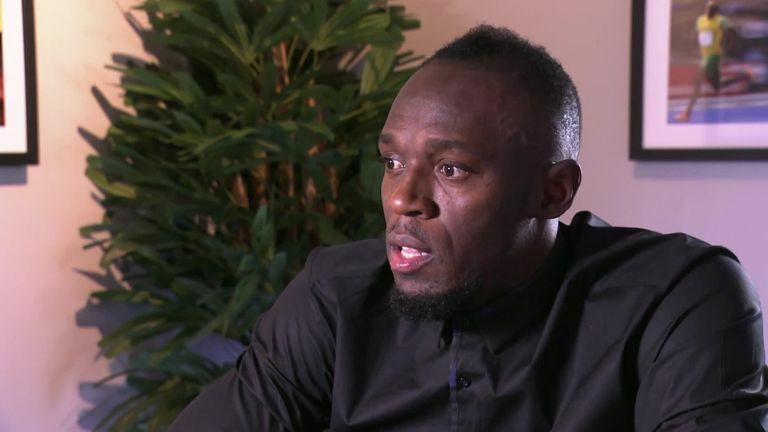 Usain Bolt says he has received support from Manchester United’s Paul Pogba and Manchester City’s Raheem Sterling in his desire to pursue a football career. United fan Bolt, an eight-time Olympic goal medallist, retired last year from athletics and had been on trial with Australian side Central Coast Mariners, which came to an end earlier this month. The 32-year-old played 95 minutes for the A-League outfit in two trial games and scored twice against weak opposition, but appeared to find the transition from track to field tricky. Bolt was criticised by former Republic of Ireland international Andy Keogh, who said the Jamaican sprinter had a first touch "like a trampoline". However, Bolt has hit back at Keogh's comments, calling him a "simple player", while also revealing he has been in touch with Premier League stars Pogba and Sterling about his future. "People are going to say what they want, I'm used to this. I used to do track and field, people used to think badly of me when I started and I proved them wrong every year," said Bolt. "I've talked to Pogba and Sterling and they are happy to see me trying, they say 'come on, you can do it'. "They support me, so I'm not going to worry about some simple players saying some things about me because I have high-level players knowing this is a dream and what I want to do. "This is not about all about the money. This is a dream, and I want to try and see how good I can be."